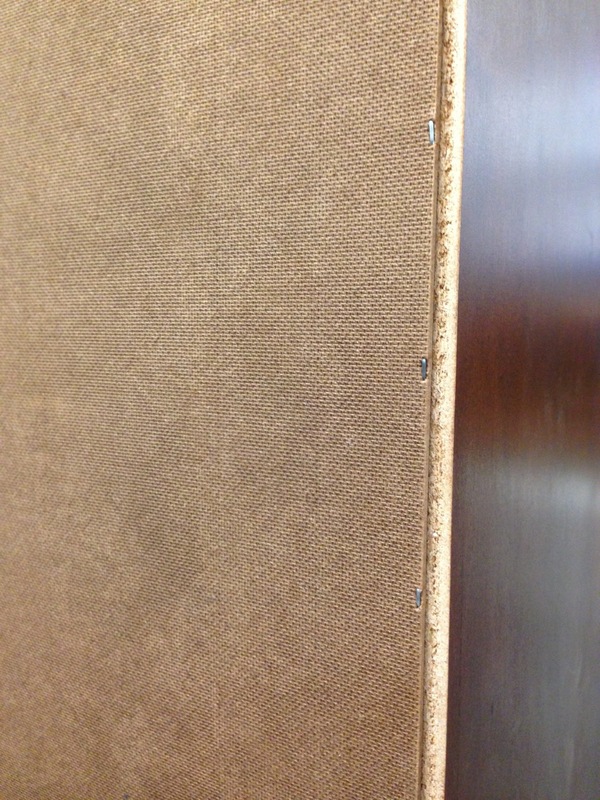 Would Duncan Phyfe have used Masonite® or Luan? Posted by Mark B. Firley in Furniture, Unsubstantiated opinion. Well, maybe not Duncan Phyfe or the Seymours (John the father and Thomas the son). They had very well-heeled customers paying top dollar and expecting the best. Like Thos. Moser today, all their furniture was finely made from superior material with impeccable finish. But not everybody could afford the best. There had to be the equivalent of Ashley and Basset furniture. I first started think about this while walking through a local consignment shop. 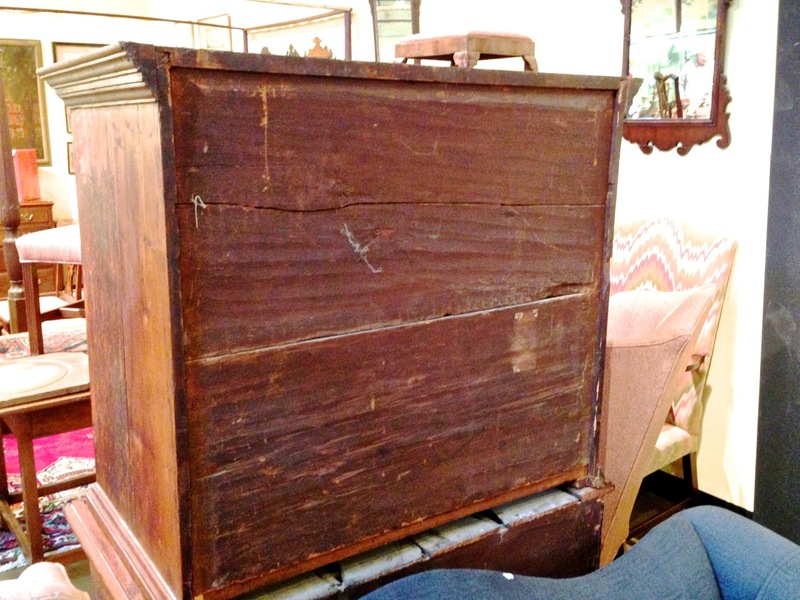 One quick check for the age of furniture is to look at the back. 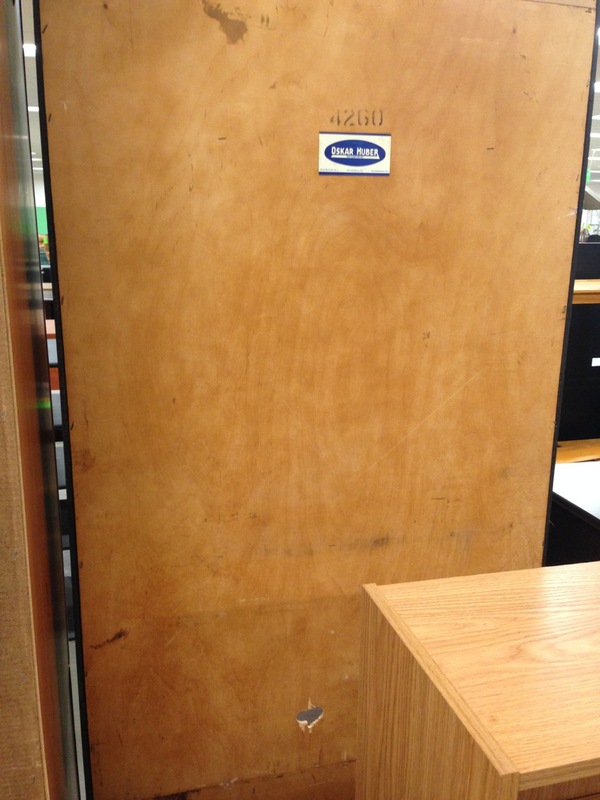 Plywood or hardboard means it’s most likely 20th century. 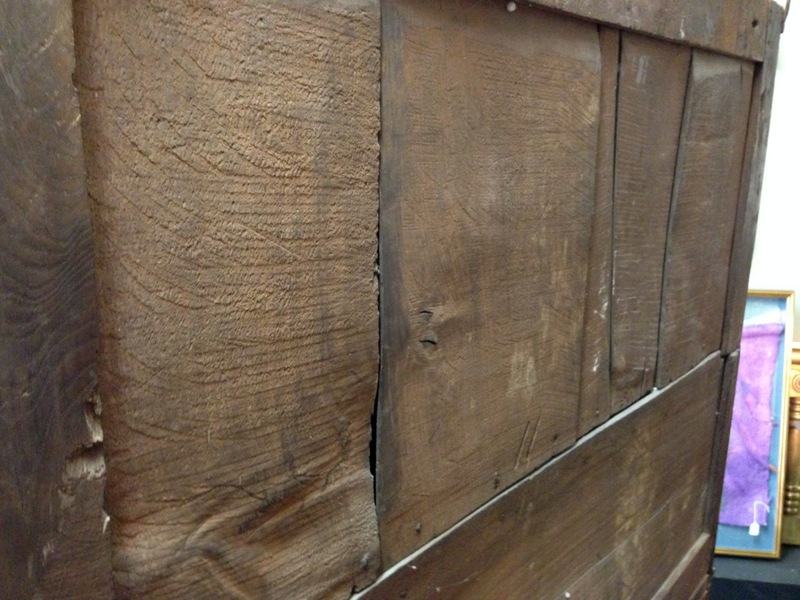 Plywood might have been available in the 1880’s. 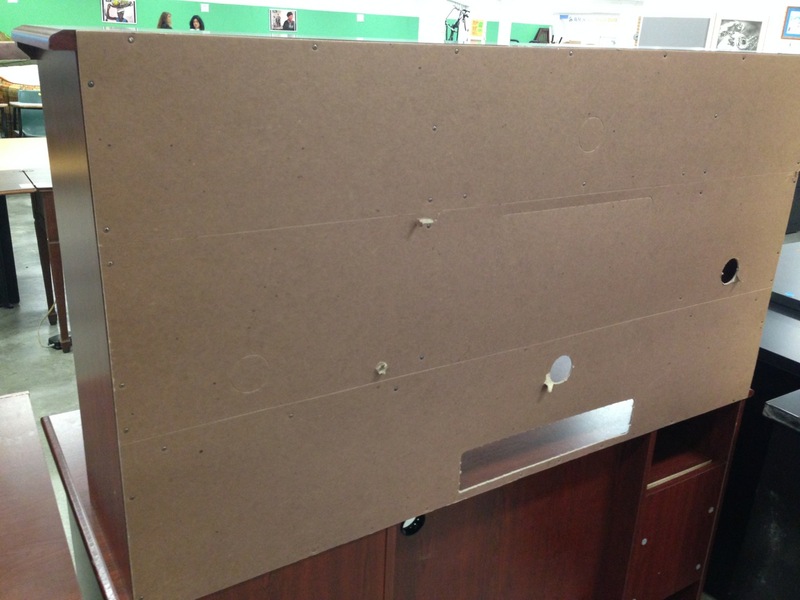 Cardboard is the ultimate low-end material. Mostly for RTA (Ready To Assemble) furniture. Cheap and can be folded to fit in boxes. I don’t love it but it has its place in the retail hierarchy. 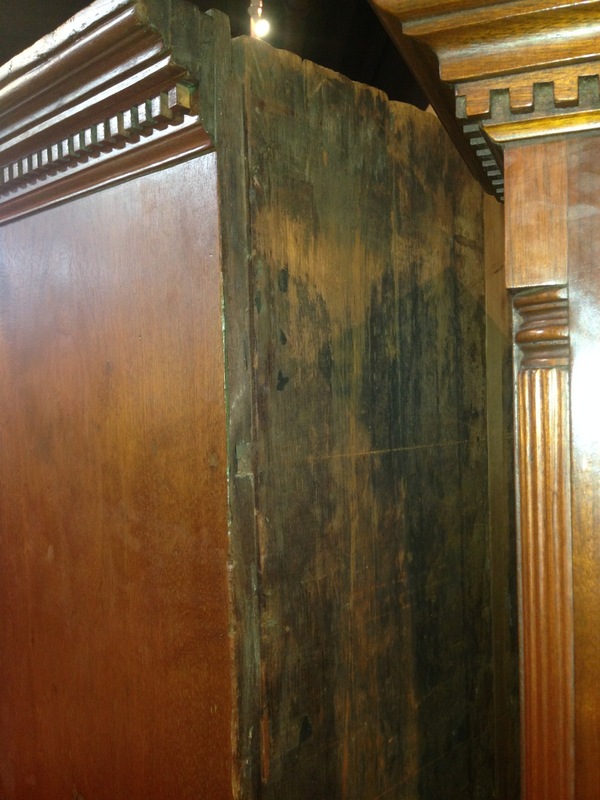 I don’t believe that mid and lower level furniture makers worried much about the backs of furniture. 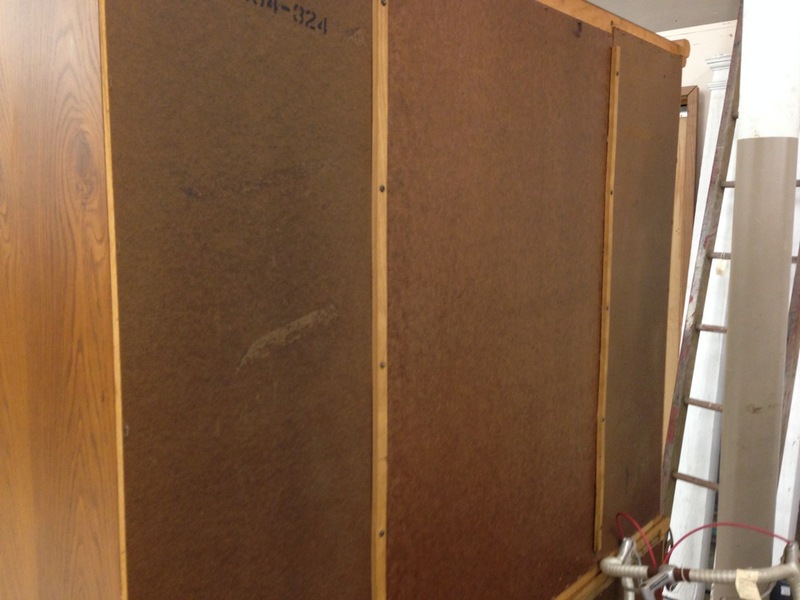 The function of the back is to keep the carcass square and keep the dust out. Sheet goods do this quite well. 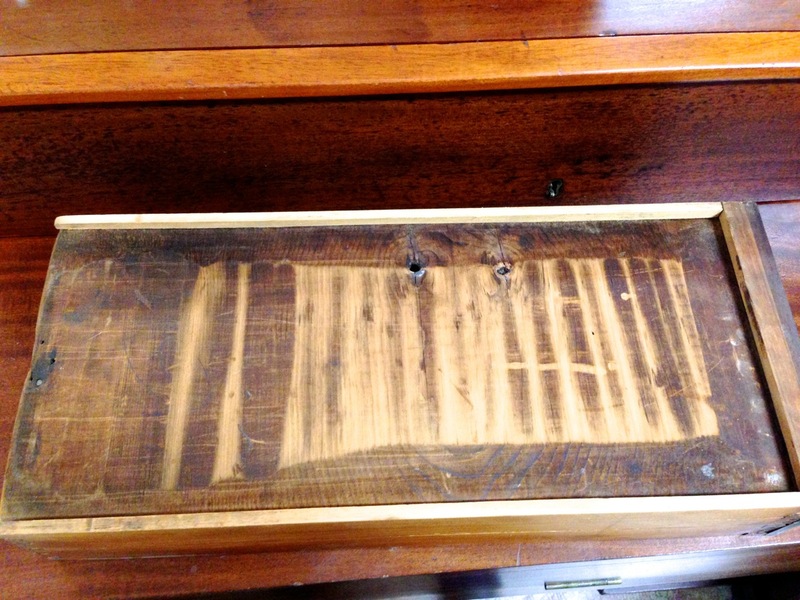 These makers used what they had on hand including wood that couldn’t be used anywhere else. Wood had to be purchased and these people couldn’t afford to not use what they bought. 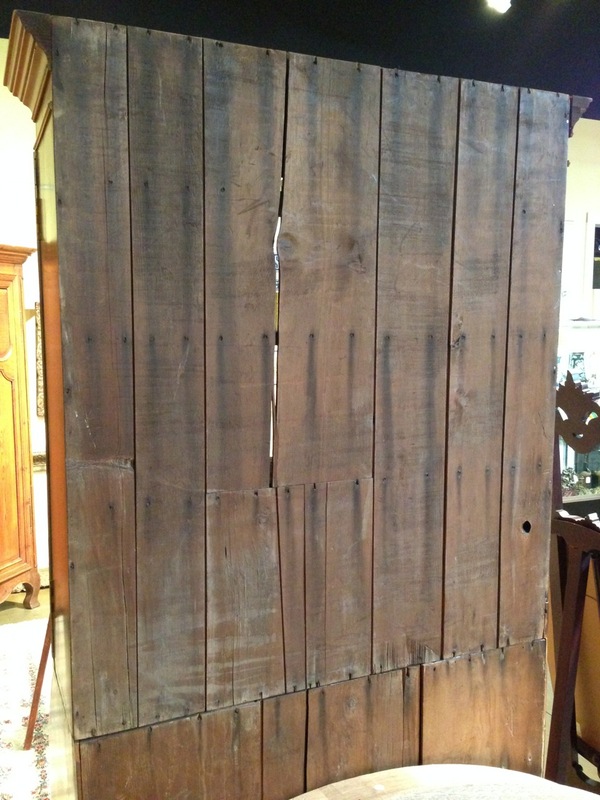 The backs are against the wall and once delivered are rarely seen. It just doesn’t matter. I think that if sheet goods were available, they would have been used. And they didn’t worry too much about drawer bottoms either. Made to fit and that’s about it. Not pretty but it works. It just didn’t matter. It’s just commerce. Posted by Mark B. Firley in Unsubstantiated opinion. 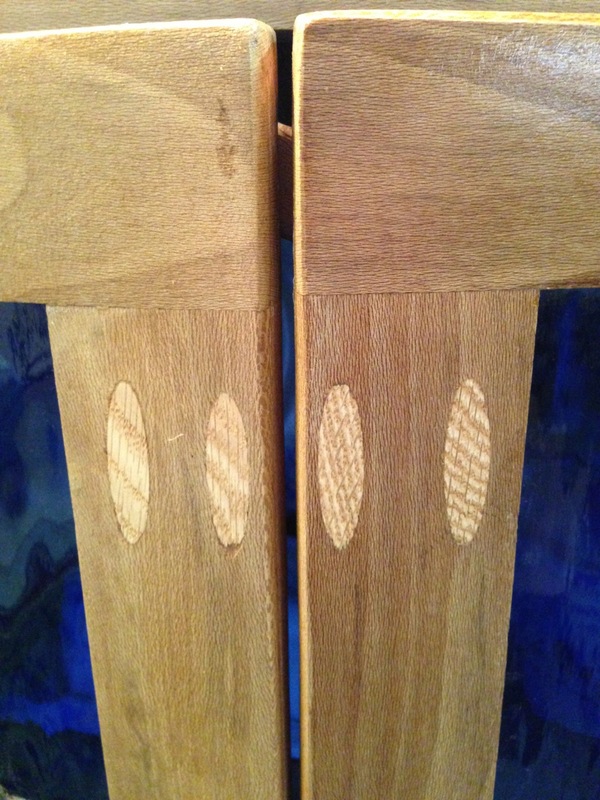 I have been anxious about all the conflict and flux in the woodworking universe. To help calm myself, I went out seeking woodworking comfort food. Klingspor is a global abrasives manufacturing company with an American division. This division has three retail woodworking stores in North Carolina. 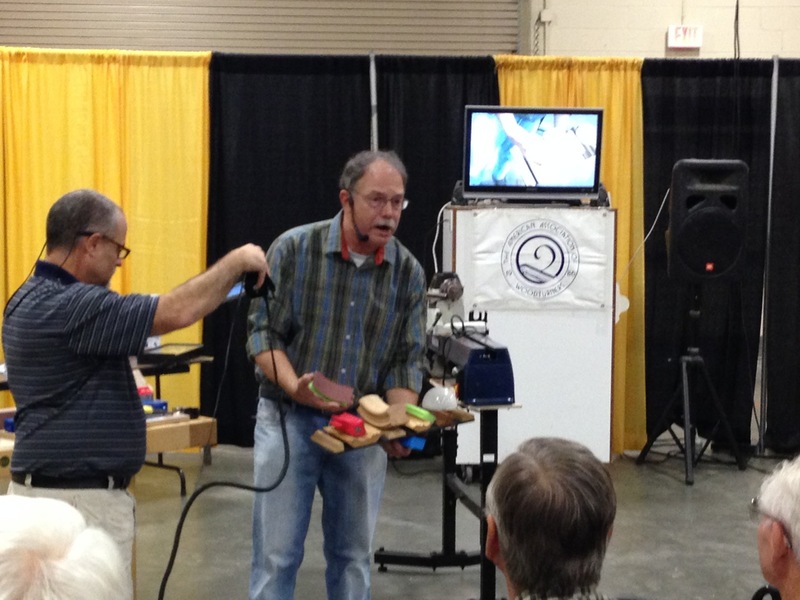 They are having their 14th annual Woodworking Extravaganza a third of the state away in Hickory, NC. It has all the usual extravaganza stuff, various manufacturers, demonstrations, competitions and lots of sandpaper. They sell roll ends, surplus, discontinued products. Boxes and boxes of the stuff. I am still working through my box of sheet sandpaper bought three or four years ago. This year there was the added attraction of the (in)famous Scott Phillips. For those not familiar with Mr. Phillips, he has been the host of Public Television’s The American Woodshop for 17 years. This is a little unusual in that Mr. Phillips has been associated with Woodcraft. In North Carolina and on-line, Klingspor is a competitor of Woodcraft’s. Who knows how relationships in corporate America work. Watching Scott work, I realized that there are some differences between Scott and the legendary Roy Underhill. The obvious one is that Roy eschews the use of power tools while Scott embraces them. Sometimes while they are running. Roy has studied and is a practitioner of traditional methods and techniques. Scott is not bound by tradition and is willing to stretch and experiment with ideas on the use and application of tools. Scott is a pioneer and I do not think we will see his like again. There are similarities between the two. Both are entertainers and know how to work a room. Both are passionate about their woodworking. Neither is afraid of hard work. During a demonstration, Scott realized the Kreg Foreman was not plugged in. He didn’t raise a fuss and demand that someone fix it. He humbly crawled under the table and plugged it in. I also have never heard Roy ask anyone to plug-in any of his tools. 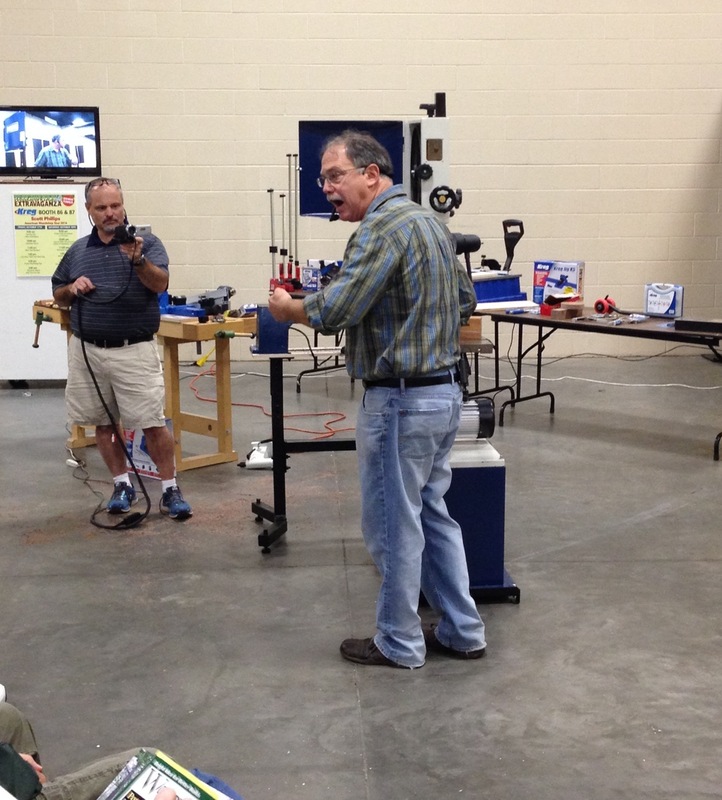 While I was there, Mr. Phillips was showcasing the year’s best new woodworking product. As luck would have it, the manufacturers of the best new products all had booths there. It just goes to show that Klingspor only invited the best manufacturers to their show. Scott Phillips demonstrating the best new products. A few years back, I had the chance to talk to Mr. Phillips at a Cincinnati Woodcraft the day before Woodworking in America opened. I think he really does understand his place in the woodworking firmament. He views himself as the guy that demonstrates that anyone can woodwork. He tries to keep things simple and fun. Many of us watch his show and roll our eyes. I don’t think those who do are his target audience. His show is always entertaining although perhaps not for the intended reasons. Update: This blog has been modified to correct a word omission. A Different Aesthetic or Just Wrong? 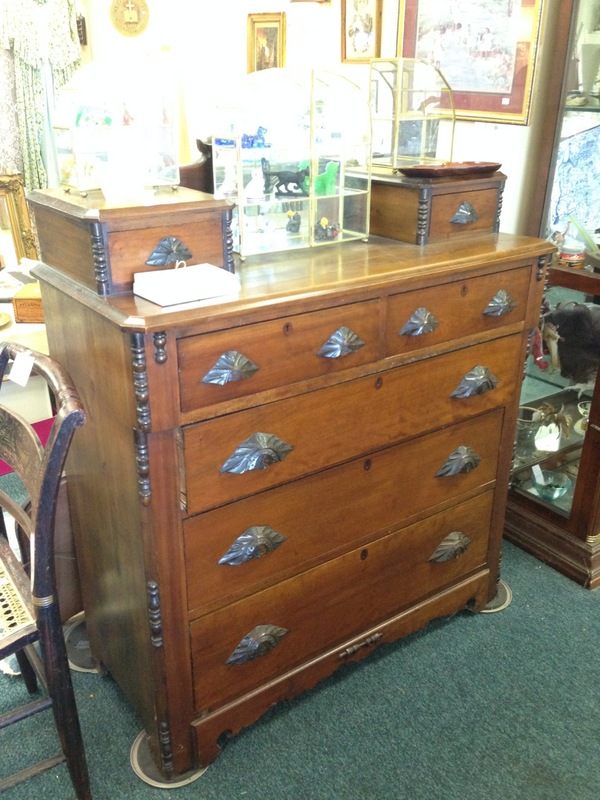 Posted by Mark B. Firley in Antiques, Dovetails, Furniture, Unsubstantiated opinion. Can there be anything that goes against conventional tastes and standards that it can be considered wrong or are we tolerant of everything anyone does as long as it doesn’t cause us direct harm? Twice a year there is a antiques festival in Cameron, NC. There are a large number of dealers in town and most of the open areas between buildings are filled with itinerant dealers. The churches in town make money by charging for parking. The unfortunate homeowners stuck in the midst of this bazaar get to sit on their front porch and look troubled while worrying about their lawn. Something for everyone. 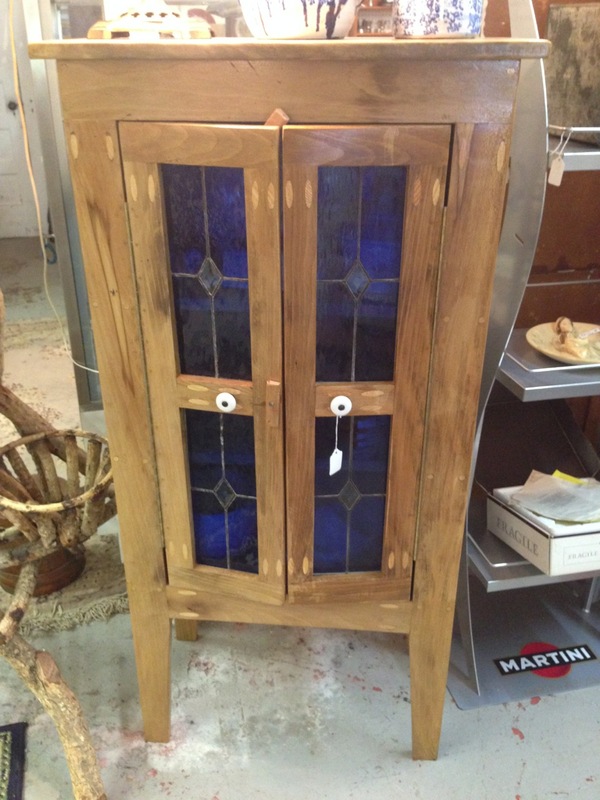 In one of the permanent shops is this cabinet that has fascinated me for a few years now. Obviously not an antique. And obviously not to everyone’s taste. It has been there for a few years. A closeup of pocket screw plugs as ornamentation. A daring aesthetic or just ugly? 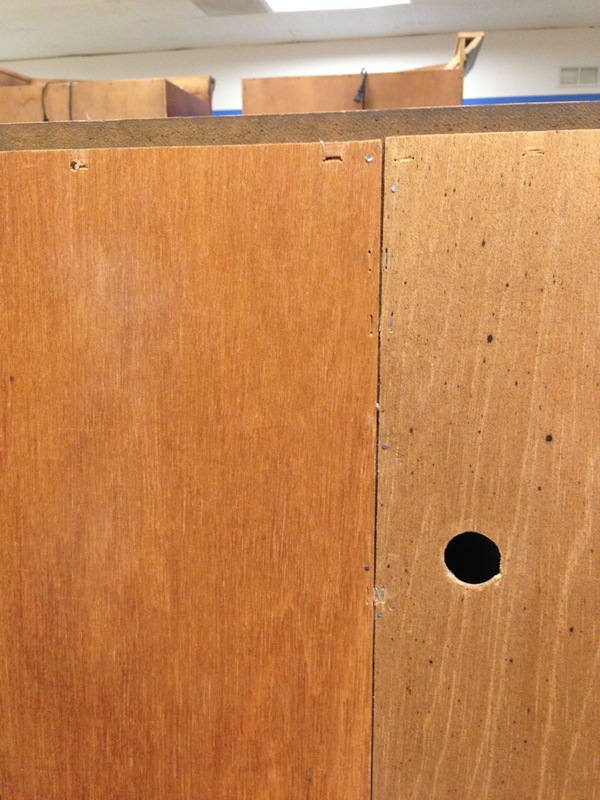 It is unusual to see pocket screw joinery (as popularized by Kreg Jigs) exposed. Pocket screws are conventionally used in the interior of cabinets and some mid-range custom furniture. I have a jig and use it for fixtures and a quickie table or two. Our mantle is built up with pocket screws. I am not endorsing pocket screw joinery. I know a few of you will be offended by me mentioning it without flat out condemnation. Pocket screws are useful in certain situations and in certain places. Just not usually celebrated on the show side of furniture. But it takes all sorts. Pocket screws are not a new invention. The technique has been around for years. 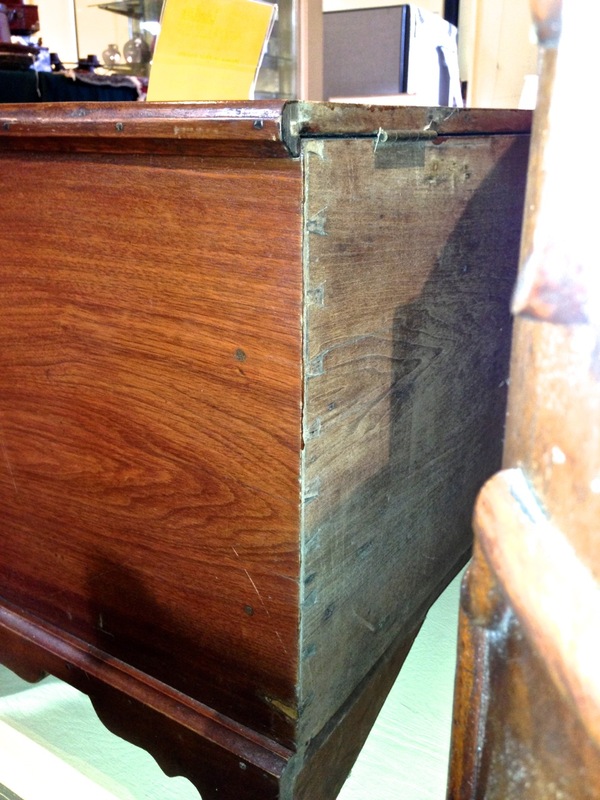 I have seen many 18th and 19th century case pieces in which the top is attached using “pocket screws” through the back rail. Examples as I come across them. But this one is different, really! 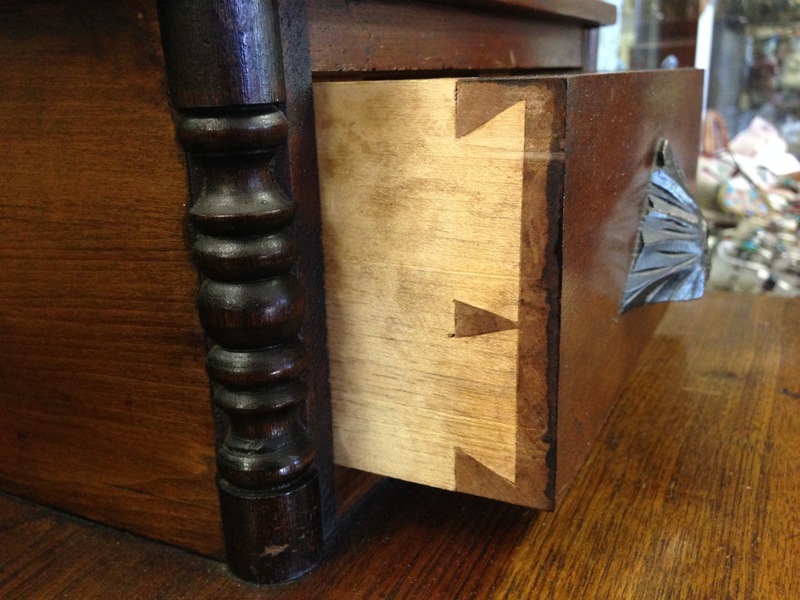 This drawer side is having an internal dialog as to the proper dovetail angle. 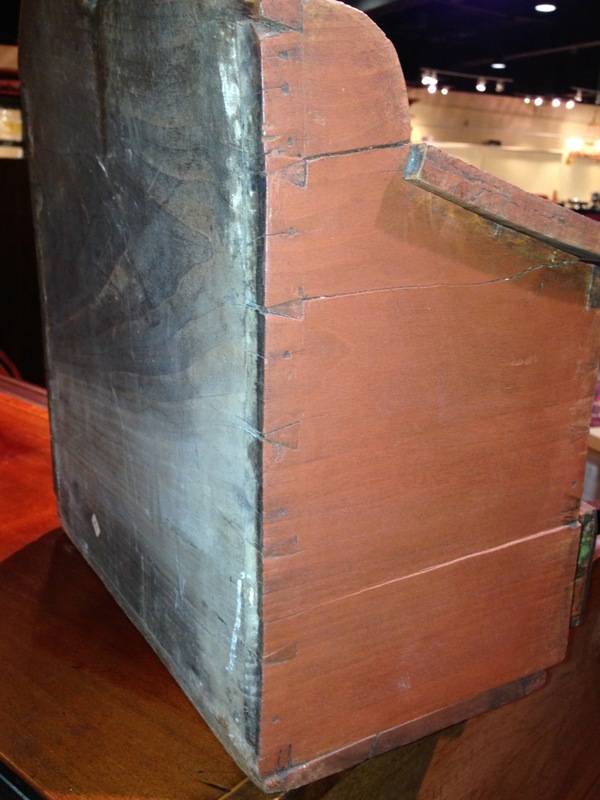 It is a hand cut dovetail from what I believe is a factory built piece of furniture. Which makes it more interesting to consider if this was the standard way they cut their drawers or an aberration. Pick an angle, any angle. Why limit yourself to one? 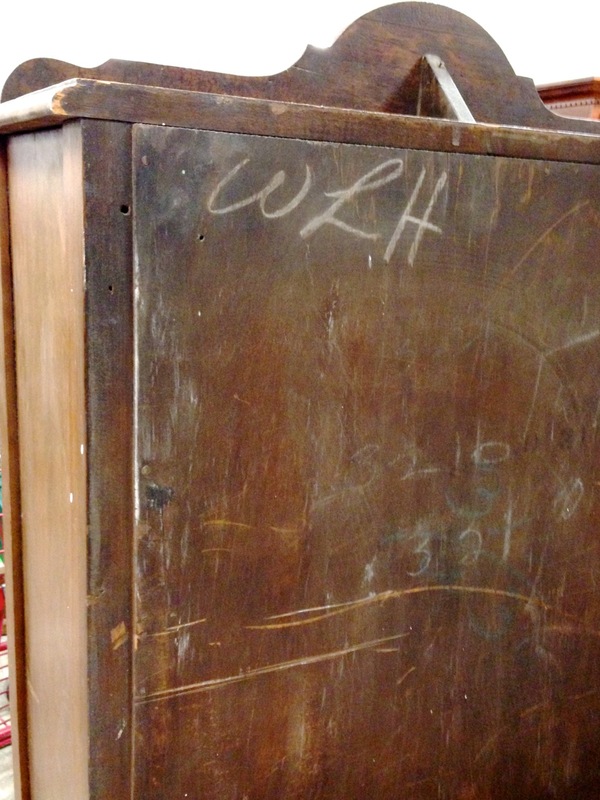 And it came from this dresser. More pictures when I post the Cameron set in a few days. Why I dislike shabby chic.